I promised to go outside for this next post, and so here we are in the demo garden… um, last summer, since the scarlet runner beans are not blooming yet, or even growing much. But we have something to look forward to, even on a cold drizzly spring day! Scarlet runner beans are Phaseolus coccineus, and therefore related to but not identical with the common bean, Phaseolus vulgaris, which includes most of the beans we think of as green beans (sometimes yellow or purple or mottled) and those we cook from dried (but that are not Vicia or Vigna or one of the other Old World beans). But runner beans are edible as well, even if gardeners in this country often grow them simply for their beautiful flowers. They can be eaten either in the pod stage or as shelly beans, but should be cooked before eating (sorry, demo gardeners who snacked on them last year – I just learned this!) because they contain a poisonous lectin (as do some common beans, particularly kidney beans). Other differences: runner beans are perennial, though marginally so in this area, and the roots are also edible. And runner beans twine clockwise while most other climbing beans twine counter-clockwise. Ah, but what will they be twining on, you ask? That’s where the cattle panels come in. I found this idea on a garden forum, and it looks like it’s going to work really well. Cattle panels are 16 feet long by about 4 feet high, heavy-gauge galvanized wire, and are available at farm supply stores (we went to Southern States). They vary in price but should cost about $20 each. We bent our two panels into loops there, tied the ends together, and transported them in pickup trucks (yes, you will need a large vehicle). 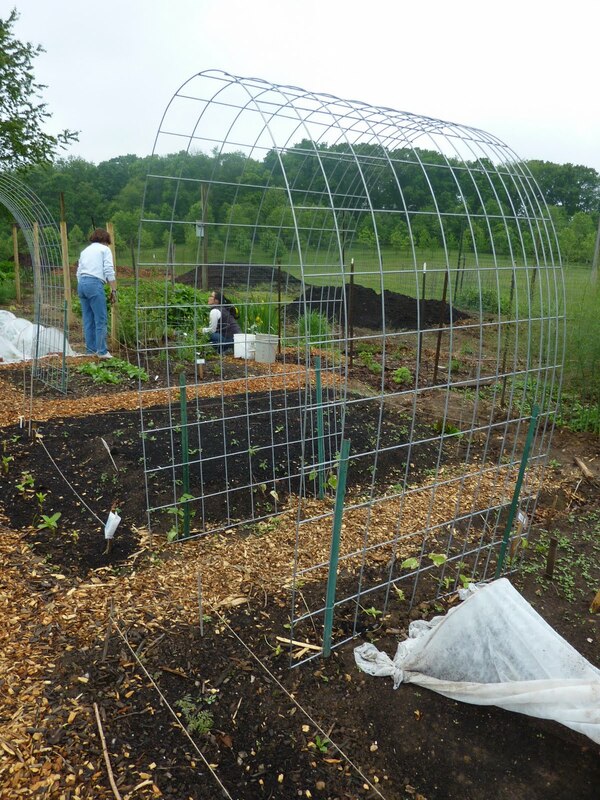 The arbors went up easily: four metal T-posts in the ground, and the arched panel released in between and wired on. 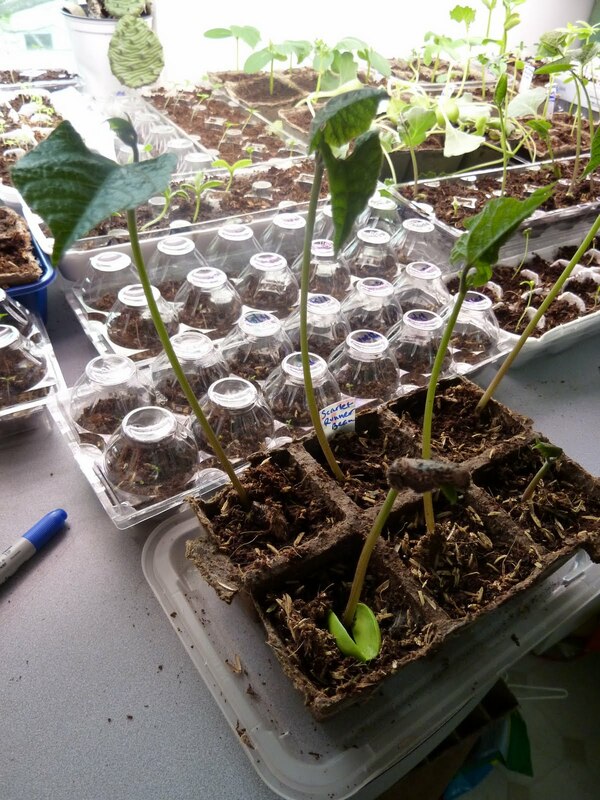 We’ve already planted the runner bean seedlings, three on each side. Runner beans grow fine direct-seeded, by the way, and the seedlings would have appreciated warmer temperatures than we have this week, but they should survive. I just couldn’t wait to get started! The other cattle panel arch will display – you guessed it – mouse melons. More on that later. Love this idea! My trellises are all getting old and worn out, so I've been on the hunt for new ideas. I'm getting some cattle panels this weekend – thanks! 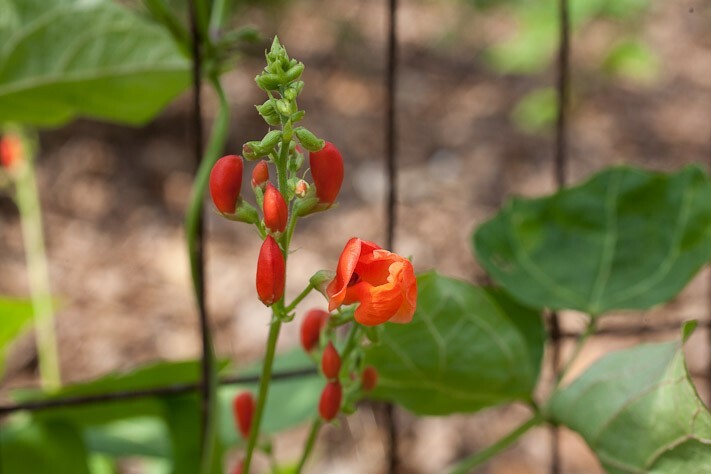 I nearly always grow scarlet runner beans on my vegetable garden fence(and share them with the deer). I haven't purchased the seeds in ages as I always save some beans to plant the next spring. I planted a few beans last week to grow up a new ornamental trellis on my garage. I'm hoping they will fill the space with their rough green leaves and bright red flowers while I wait for my sloooow clematis vine to do its thing. The beans are up and growing and, yup, those cotyledons are sitting at soil level. Glad to be spreading the cattle panel idea around. The farm stores won't know what hit them. 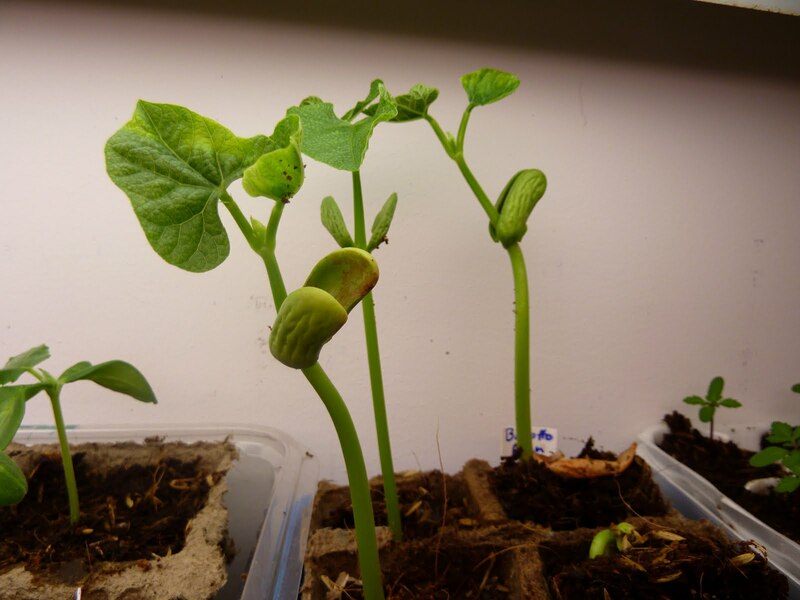 You should be able to grow many climbing plants on them – cucumbers, gourds, etc. Linda, in case you ever want to go beyond the basic scarlet runner bean (not that you need to) there are a bunch of cultivars out there with red and white, pink, dark red etc. flowers.